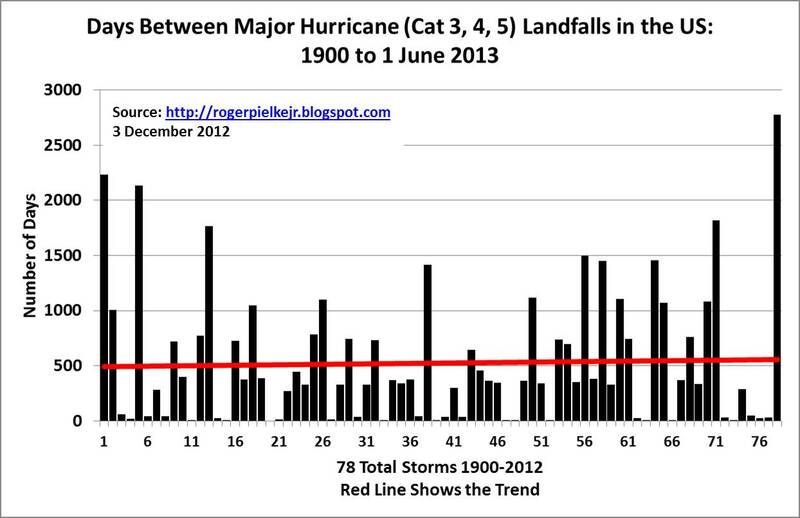 The graph above provides an update to data on the remarkable ongoing US "intense hurricane drought." When the Atlantic hurricane season starts next June 1, it will have been 2,777 days since the last time an intense (that is a Category 3, 4 or 5) hurricane made landfall along the US coast (Wilma in 2005). Such a prolonged period without an intense hurricane landfall has not been observed since 1900. Even with hurricane Sandy and its wide impacts, things will indeed get worse. The US coastlines as a whole have actually been very lucky with respect to hurricanes since 2005, with aggregate damage (even including aggressive estimates for Sandy) 2006-2012 falling at or below the historical average. Sandy made landfall as a post-tropical cyclone of hurricane strength -- a phenomena that has only been documented 3 times since 1900 (1904, 1924, 1925 -- later this week I'll have a post on Sandy damage estimates). The long-term intense hurricane drought means that a mere "regression to the mean" will see more hurricane landfalls and considerably higher damage in the years to come. The fashionable talk these days of a "new normal" is of course utter bullsh*t. Just wait until we return to the "old normal" -- I know that it may be hard to believe, but both hurricane damage and climate hype are set to increase dramatically in the years to come. Why is NOAA Acting Like it has Something to Hide? Science, Politics and the "Hurricane Deductible"